Chevrolet Aveo RS | What Car? This is Chevrolet's Aveo RS concept car. The company hopes its European-inspired hot-hatch looks will appeal to young American car enthusiasts. Giving clues to the next-generation Aveo, the show car is strikingly designed with plenty of eye-catching kit. 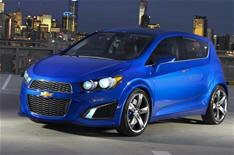 Coated in electric blue paint, the car has Chevrolet signatures including the two-part grille and round tail lamps. For the show, designers have made the car's face more aggressive by adding a lower mouth with aluminium trim and integrated foglamps in the brake-cooling inlet. At first glance it might look like a three-door hatch, because the rear door handles are hidden in the C-pillar. The exposed headlamps are inspired by motorcycles. Other sporty touches include the rear spoiler and centrally mounted exhaust with chrome tips. Five-spoke, 19-inch alloy wheels complete the package, with the large blue brake calipers visible through the openings. Finished in matte black, with black and electric blue accents, the car's interior has been carefully designed, too. It has contrast stitching across the instrument panel, door inserts, steering wheel and gearlever cover and floor mats. There's ice-blue backlighting on the instrument panels, and the round display with circular inserts and round aluminium trimmed side vents echo the motorcycle-inspired theme of the exterior. Chevrolet promises that Aveo buyers will be able to personalise their car, a move that has proved popular in small cars from both Mini and Fiat. A 138bhp 1.4-litre turbocharged engine powers the Aveo RS. It's combined with a six-speed manual transmission. Visitors to the show will see the display car's bespoke engine cover in graphite silver, which has also fluid filling caps in ice blue.